Belief in the power of these objects runs through every culture. From the Christian crucifix and the Jewish Star of David to the wiccan pentacle to the Native American dreamcatcher, these objects may be worn, carried in pouches or pockets, or positioned in a dwelling to guard against malignant forces and bring good fortune. Shapes also confer meaning: anything egg-shaped or fish-shaped brings good luck and fertility, a bee boosts business, a stone arrowhead and a hand work against evil, a serpent brings long life and wisdom. 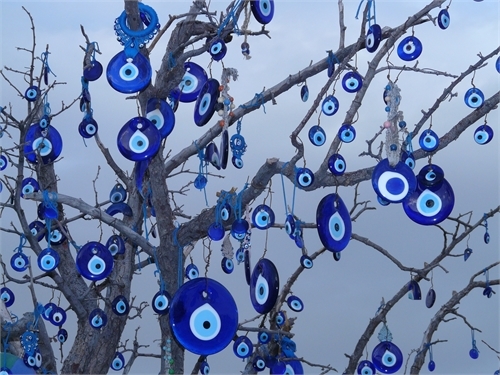 In a world that defies explanation and where terrible things happen, amulets offer a cherished bit of comfort, whether that imbues protection from the “evil eye,” illness, or other disaster. The tradition continues today, from police officers wearing St. Jude medals for protection to “kitchen knots” in aprons to safeguard food. Believed to be spiritually or astrologically significant, talismans endow the bearer with that extra something needed to close the contract, win the competition, or achieve that big goal. Sports players are known for their superstitions, such as Oakland A’s baseball pitcher Vida Blue who wore a special cap that became his lucky talisman or Olympian track and field competitor Sanya Richards-Ross who wore a bullet necklace during races, which she believed enhanced her speed. Many cultures credit specific energies or traits to various gemstones. Sometimes carved, sometimes not, these stones are said to produce feelings that indicate their purpose. The mystical properties of stones arise from their composition and their color. Red corresponds to passion, enthusiasm, and energy. Orange relates to close relationships and personal satisfaction. Yellow alludes to fun and joy. Green relates to hard work and accomplishment. Blue enhances clarity and perception. Violet relates to higher truth and spirituality. Pink stimulates and confers energy. Clear or colorless stones and crystals symbolize energy. Silver possesses great power and is said to be peaceful and gentle. Gold relates to strong ambition. For more reading on the variety, types, and purposes of amulets and talismans, read The Book of Talismans, Amulets and Zodiacal Gems by William Thomas Pavitt, Credulities Past and Present: Including the Sea and Seamen, Miners, Amulets and Talismans, Rings by William Jones, A History of Amulets by Martinus Fridericus Blumler, A History of Amulets, Charms and Talismans: A Historical Investigation Into by Michael Levi Rodkinson, and Engraved Gems, Signets, Talismans and Ornamental Intaglios, Ancient and Modern by Duffield Osborn.